Alibaba posted strong quarterly results(Q3 2015) with 28% annual growth to reach 713 Bn yuan in GMV. Despite the chinese economic slow down, Alibaba was little affected. This is inline with our earlier prediction, economic slowdown factors is not going to affect Alibaba. 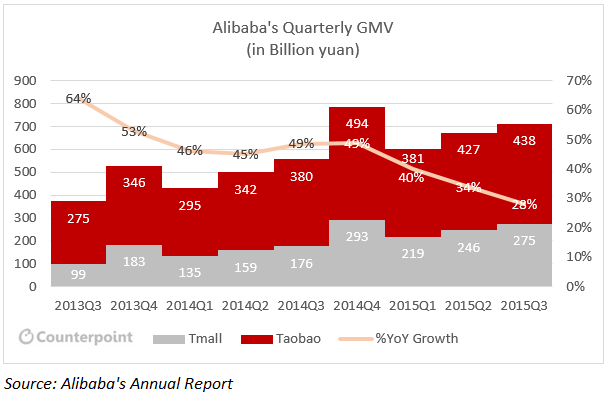 Both Tmall, which is similar to Amazon, and Taobao, which is a chinese counterpart of Ebay, showed growth of 39% and 178% respectively over the Q3 2014. Overall performance and growth in revenue is above its competitors. Key performance indicators include: Revenue growth of 32% on YoY basis, Annual Active Buyers of 386 Million and Mobile MAU of 346 Million. While there are some concerns with aspects of the Chinese economy, the consumer is relatively okay. Wages have grown almost 10% annually in the last couple of years, the savings ratio is high and can be liquified easily. And while disposable incomes have slightly decreased over last year, it’s not yet a cause for concern. Alibaba should continue to benefit from this relatively benign set of circumstances in the short-term. As per our latest Market Pulse study, Smartphone penetration of total handset sales in China reaches as high as 96%. And ‘mobile first’ is therefore a key strategy for online marketers. 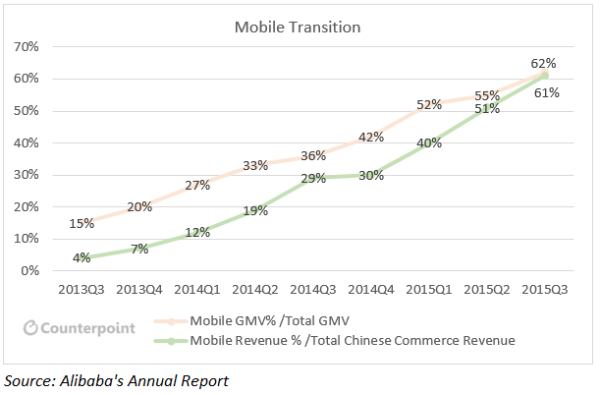 Alibaba was an early mover; more than 60% of total revenue and GMV came from mobile customers in the last quarter. 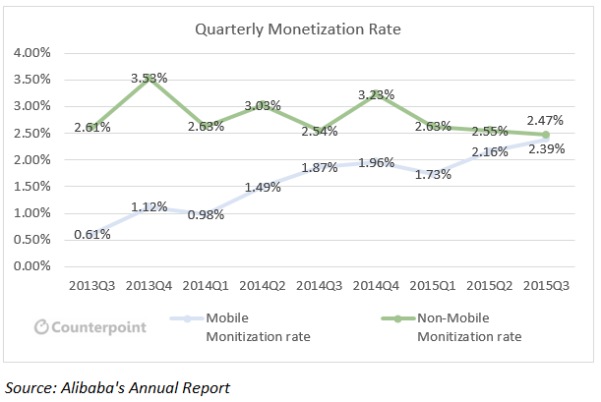 A steady and constant downward slope for non mobile monetization rate continues and the difference between mobile and non-mobile monetization is closing steadily. Mobile revenue from China retail marketplace was around RMB10.5 billion or $1.7 billion representing a year-on-year increase of 183%. O2O is essential and Alibaba is serious about “Omni channel” performance. Online shopping only accounted for 10% of the Chinese retail market, which is valued USD $~1 Trilllion and the main opportunity lies in the online to offline (O2O) combination. After saturating big cities in China, Alibaba is extending its O2O reach to Tier-II and Tier-III cities. It has already connected 180,000 offline stores across 330 cities with its mobile platform. Rural coverage was one of Alibaba’s key strategic focus areas. 45% of China’s population lives in rural villages. Alibaba increased its footprint to an additional 4000 rural villages during 3Q15. Alibaba is partnering with HUL to use its distribution system in rural China. In return Alibaba is sharing e-commerce consumer insights with HUL. Revenue from international commerce retail business was RMB 481 Million or US$ 76 Million, a year-on-year increase of 15%. Alibaba wants to drive Singles Day sales on November 11th to make it rival Black Friday and Cyber Monday in which have grown from a US phenomenon to be broader international shopping events. Alibaba will collaborate with ~100 agricultural and Government organizations from 25 countries in a cross border trade initiative that will start on the same day. There will be representative from 39 countries in Singles Day retail sales. Suning warehouses will be supporting fulfilment of FMCG products during Singles Day sales. Alibaba opened a data center in Singapore to serve regional as well as global customers. Alibaba’s cloud computing and internet infrastructure revenue grew 128% year-on-year year-over-year to RMB649 million. Alibaba has made an offer of $3.5 Billion to buy Youku Tudou, known as the YouTube of China. If the acquisition goes through it will give Alibaba a video content creation platform. Video content is a critical element in digital web services and will become even more relevant in future as higher speed data networks develop. Alibaba is also keen to create an online Chinese market (“China Bazar”) outside China. 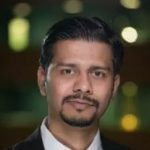 India is a likely target. Alibaba is already in advance talks to invest an additional $600 Million in Paytm (One97) during 4Q 2015 upcoming quarter. An initial is expected to include 100 million products with prices starting as low as one cent and rising from there.